It was windy. And cloudy. And rainy. 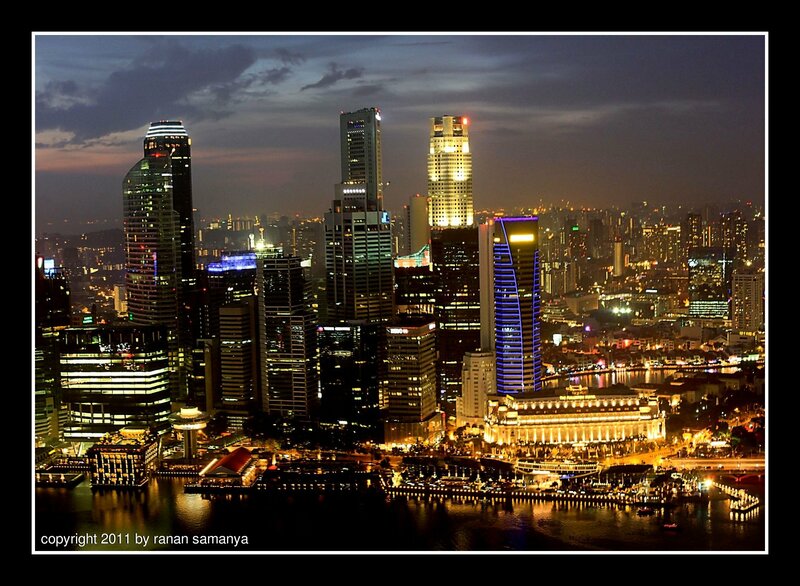 I waited almost 2 hours on top of Marina Bay Sands -200m high- that day, hoping to get a nice sunset. Sunset came and went by almost unnoticed. But the twilight lingered for some time. This picture is a result of stitching five vertical frames. I could have done it with one horizontal frame at 24mm, but then I would have missed the fun and details (not that there is much detail here). All individual frames were taken with my EF24-105mm f/4L IS USM lens @ 45mm, f/5.6, ISO 800. All were handheld for 1 second (even monopod is not allowed here, and the plentiful of security personnel were very sharp in spotting pods). I gave a second thought, then decided to take yet another series of frames, six horizontal ones this time, and stitched them together. I didn’t pay attention to the horizon, and lost much of the reflection on the water at the bottom of the stitched image due to cutting. All individual frames were taken again with my EF24-105mm f/4L IS USM lens @ 24mm, f/6.3, ISO 400. All were also handheld for 1 second. Click on the images for better resolution; you just have to. Only then will you notice that (especially for the first image) it is not that sharp. Ouch!